With the recent publication of Yates’s complete stories (p. 273), there’s a concerted effort to restore all the work of this writer’s writer (who died in 1992) to print. This melancholy tale of two sisters begins, like so many Yates narratives, with high hopes for its characters—expectations that are usually dashed by experience. 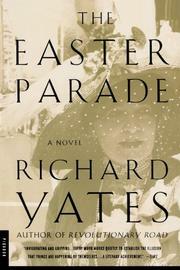 When it first appeared in 1976, Kirkus noted that “nobody sings sadder songs of the way things were” than Yates, and by the novel’s end, he makes “an effective shambles” of his protagonists’ “muffed lives.” Though they begin in youth and gladness, these sisters’ lives end in despondency and sadness. Kirkus celebrated Yates’s strong suit, “the thing he knows best—failure.” Its gravity “gives all his books their vulnerability and makes them imperative then and now reading for many people.” And now again.